Let's visit Kampung Admiralty won World Building of the Year Protected content the World Architecture Festival in Amsterdam. We will explore the sky garden, the facilities and then have dinner at the hawker centre and possibly drinks else where after. Completed in May Protected content , the 11-storey “modern kampung” features Protected content for the elderly, a two-storey medical centre providing specialist outpatient care, an Active Ageing Hub co-located with a childcare centre, dining and retail outlets, as well as a Protected content hawker centre. Together, they offer a wide range of facilities and amenities for both young and old in the community. Beyond the facilities, Kampung Admiralty has also been designed with a variety of community spaces to encourage community involvement and ownership. It was lauded by Prime Minister Lee Hsien Loong in his National Day message, and is aimed at encouraging active living among seniors, as well as inter-generational bonding. 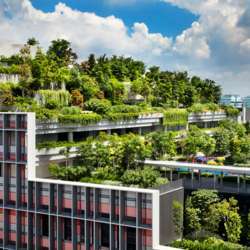 It is a multi-agency project developed by the Housing & Development Board (HDB) in partnership with the Ministry of Health (MOH), Yishun Health Campus (YHC), National Environment Agency (NEA), National Parks Board (NParks), Land Transport Authority (LTA), and Early Childhood Development Agency (ECDA). *Kampung is the Malay word for village.